Crystal Windows are pleased to announce that we are now licensed to produce, in house, the renowned and elegant Deceuninck range of PVC windows, doors and conservatories. Deceuninck are the leading extruder of PVC window profiles in Europe and have a long history on the continent as well as here in Spain. The advantages of PVC windows and doors are: excellent insulation values and the fact that many northern european countries are used to the feel and look of PVC. On the down side PVC window sections can be bulky compared to slimmer, inherently stronger aluminium profiles, especially in certain situations such as bay windows, or sliding windows within arches for example, where the combination of profiles can become much more obtrusive in PVC. Unlike a poor quality PVC, the Deceuninck profile used by Crystal Windows will not yellow, fade or deteriorate. Nor will it expand and cause difficulty in opening and locking. 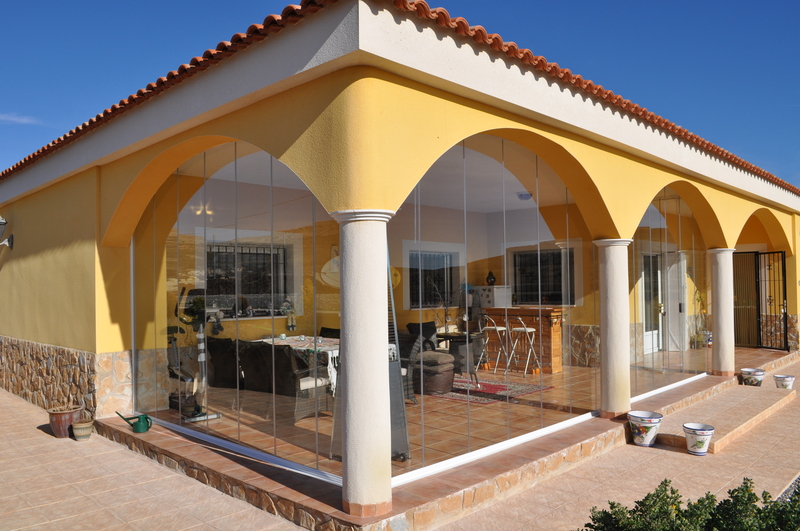 It is made for the Spanish climate and as with all Crystal Windows products is guaranteed for ten years. Crystal choose Deceuninck against other leading PVC profiles such as Rehau, Veita, Shuko, Weru etc, because while at such levels of international competition all of these companies deliver a technically excellent product, Deceuninck offer a suite of profiles for windows and doors which are uniquely elegant with a moulded contour in the section which both enhances their looks and matches very well the classic look of traditional Spanish windows and doors. Within Deceuninck´s range there is still the option of an ultra modern style of windows and doors. For more information on this product please visit Deceuninck’s website. As with all Crystal Windows products, our new and replacement PVC windows and doors are made to all the relevant european standards including the CE standard, the international bench mark for window production excellence. Everything found in the various aluminium options from arched to concertina doors can be made in PVC. NB all PVC windows and doors are fully reinforced using the correct Deceuninck sections, correctly positioned to give maximum strength and allowing all hinges and locks to be directly fixed to the reinforcement (this is not always the case with inferior products) and is essential to providing a full 10 year operating guarantee. Aluminium window sections are slimmer and inherently stronger than PVC profiles, especially in certain situations such as bay windows, or sliding windows within arches for example, where the combination of profiles can become much more obtrusive in PVC. Aluminium is the ideal material for conservatory construction, where slimmer profiles give maximum light and view. Aluminium is extruded at high temperature then coated and oven backed (polyurethane in the case of woodgrain finishes). Most other profiles are baked to reach 210°C at which powder polyester forms a coating. All Crystal profiles are maintained at a minimum of 210°C for a minimum of 25 minutes to guarantee long term bonding and hardening of the coating. Inferior baking can be noted in all windows that after a year or so do not clean back to white easily. They become grubby like PVC profiles do with age. 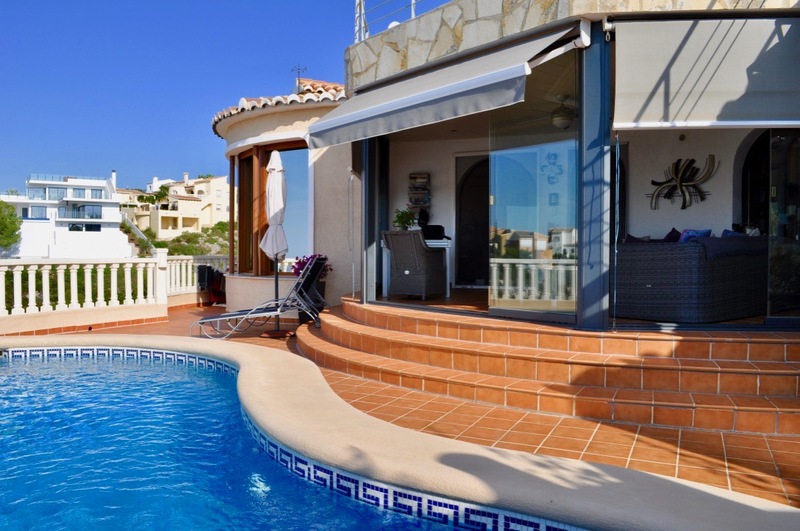 Conventional profiles have in the past been attacked and degraded in warm, moist, salty climates such as that of the Costa Blanca. In response, Crystal profiles are cadmium coated prior to lacquering which absolutely guarantees weather stability of the profile and its coating in such testing conditions. NOTE: Costs involved in treating residues from lacquering plants are more than double in the case of cadmium coating, but it is considered that the long term benefits far outweigh the initial higher costs, an approach consistent with Crystal’s policy of quality and long term value for money. All woodgrain finish aluminium used by Crystal Windows is polyurethane coated rather than polyester. Polyurethane is better suited to acquiring wood grain finishes and allows longer baking of finish at higher temperatures, producing a deeper wood grain effect which is guaranteed for 10 years. Other profiles which use polyester wood grain finish have had, in some cases, the problem of fading caused by sunshine. In white and colour finishes polyester is the better suited material and amply achieves the temperature/baking required for those finishes. We fabricate 2 ranges for opening windows and doors – standard 40mm and System 7. For sliding windows and doors we have a standard 70mm system with double glazing units of 20mm. For larger units or as an upgrade we have the S100- a 100mm system which can carry sliding leaves of 160kg and units up to 3000mm tall! 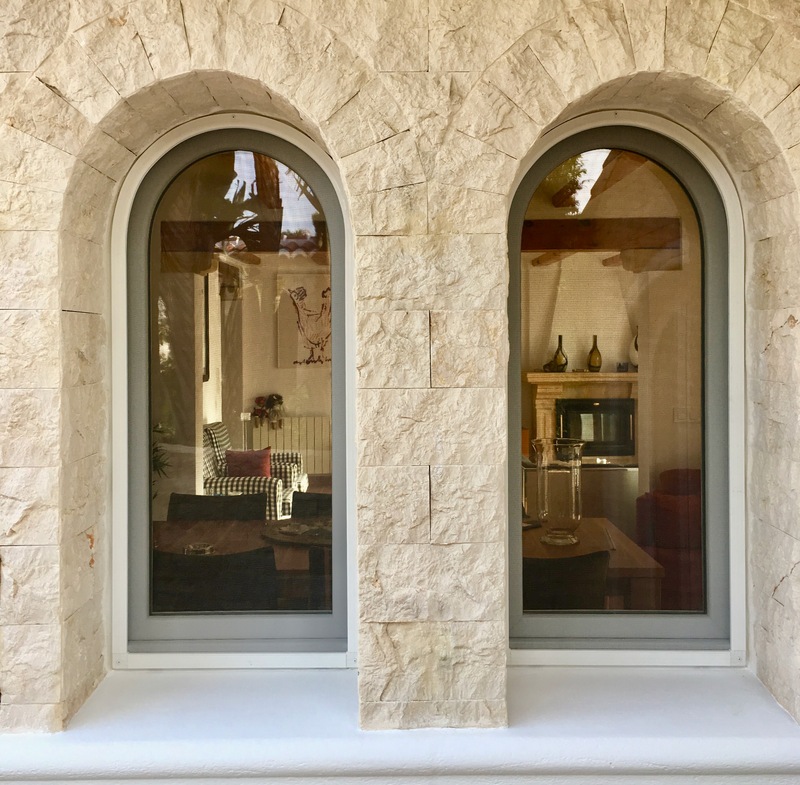 All our arched windows are made to measure by specialists using the latest computerised curving machines which produce smoother, cleaner curves. A template is taken of the arched wall, then a precision made curve is made to exactly fit the template giving a perfect result. Particularly important with arches in natural tosca stone nayas. Arches can be made in a range of styles incorporating inward or outward opening windows or doors, now with the option of tilt&turn on inward opening leaves. Sliding leaves and folding leaves can be incorporated among other options. Our sliding windows offer an ideal solution for glazing patios and terraces, or where there is little space available for opening back windows. Little used terraces can easily be converted into year round sun lounges. 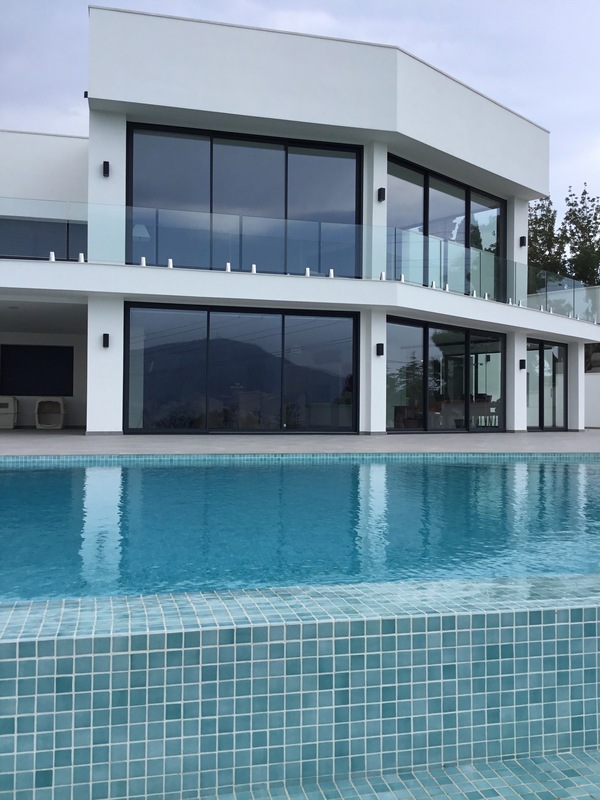 Crystal sliding windows have been designed to give customers a classically beautiful window combined with all the benefits of the latest technology. 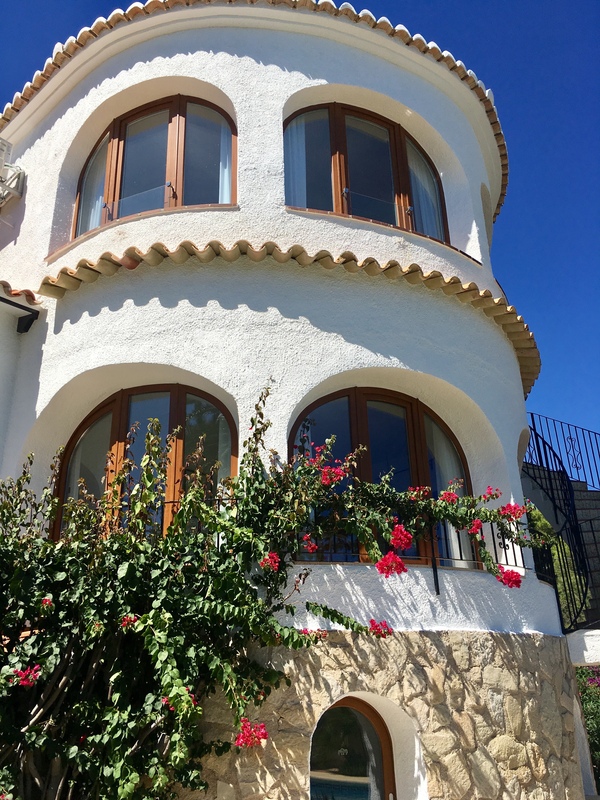 Our sliding windows perfectly replace traditional Spanish windows and are stylishly finished. Great care has been taken to ensure the windows provide the highest levels of security, with top quality locks and window accessories fitted. We can make all windows with a tilt and turn facility offering the possibility of fully opening it at the top for ventilation with added security. Fixed windows offer an ideal solution for enclosing large areas of terrace or naya where opening windows may detract from the view. Fixed windows often incorporate laminated glass for safety reasons. We have recently launched a brand new product: frameless glazing. We are now able to glaze large areas, ie patios or terraces, in glass only with absolutely no frame. This is ideal for customers who have a wonderful view but a problem with high winds, and this has been very successful. Our Inward/Outward opening windows are made to the highest standards of thermal insulation with superior security features. These windows can be manufactured in any combination the customers require. All our opening windows can be made with a tilt and turn option. his enables variation of opening, and windows can be opened fully or opened at the top for ventilation only. Our excellent surveying and design team enables us to offer numerous combinations of fixed and opening windows, each made to measure to meet the customers individual requirements. 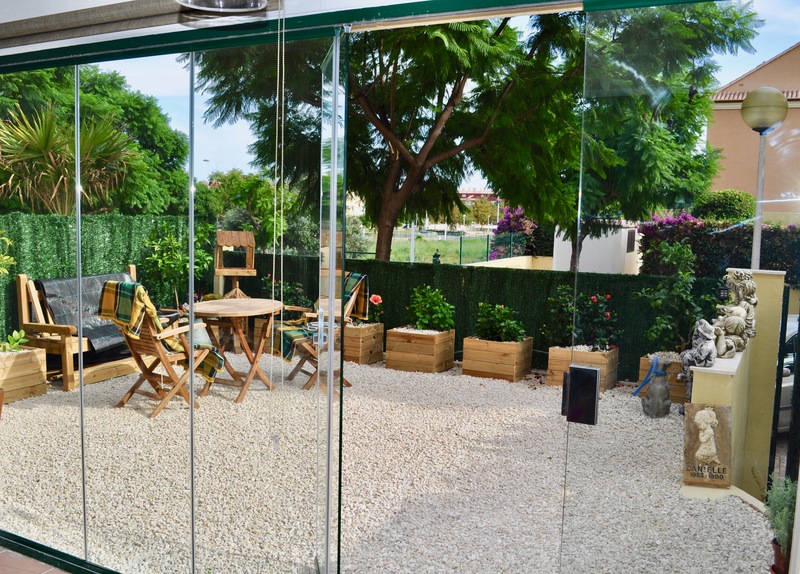 Our sliding patio doors are manufactured to ensure maximum security and easy use. These doors are beautifully designed and are available with either one, two, three or four sliding panes. 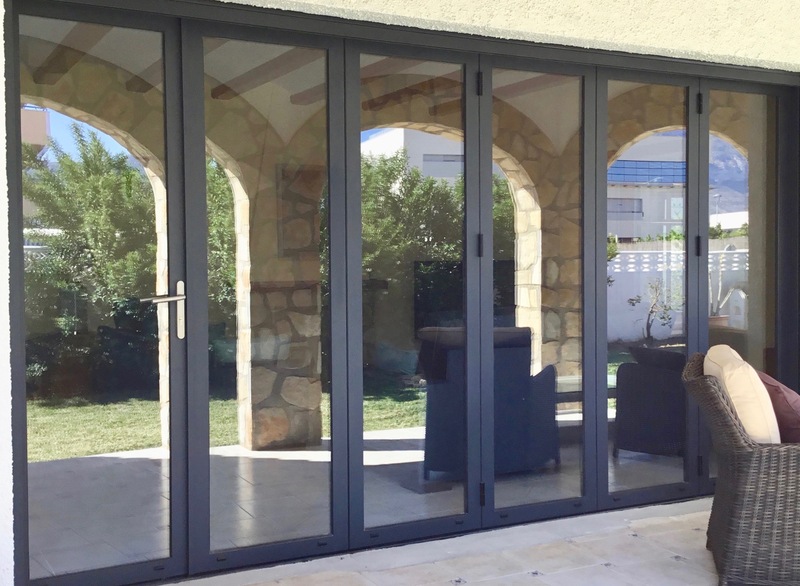 Our sliding patio doors have a triple thermal seal ensuing complete draught exclusion and considerably reduced heating costs. Free heat can be harnessed in winter. The comfort factor in the home is greatly increased apart from the obvious savings on heating bills. 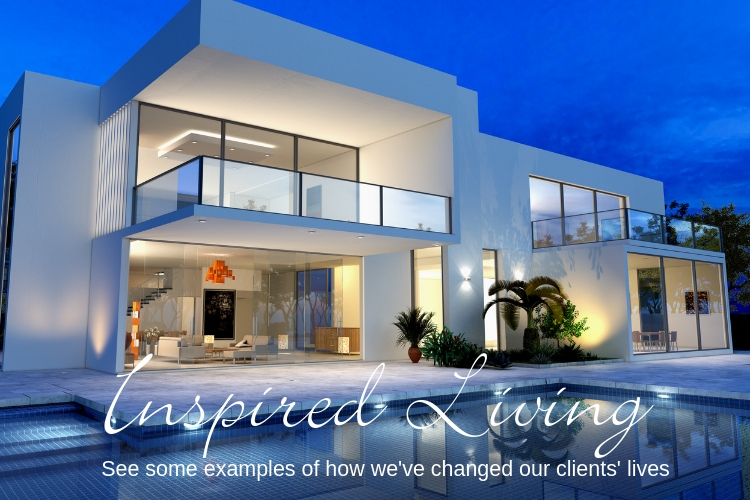 I have personally seen large lounges and the most part of an entire house heated completely by large windows on adjoining glazed terraced or conservatories. Imagine the benefit if this heat were not allowed to irradiate back out of the room. More striking is that in the case of the glazed terrace the problem with normal glazing here ‘kicks in’ at night, when the warm bright interior radiates all its warmth back out into the night (during the day the solar gain of sunlight nulifies this effect). The impact of these figures on personal comfort in the home is obvious. “Low E” Glass: like Pilkington “K” glass, “Low E (emissivity) especially designed to reflect up to 85% of ambient heat back into your home in winter, otherwise radiated out through your glazing, performing almost twice as efficiently as standard double glazing and almost four times as efficiently as simple glazing. It is now compulsory in the UK in spec. for new replacement windows. Furthermore, the effect known as cold sink experienced with single glazing, ie a pool of cold air next to the window descends and feels like a draught. This can also be felt on much larger windows with standard double glazing. Low E completely irradicates this problem. Our windows are available in the System “7” range or “Classic” range. Toughened safety glass – does exactly as it says and should it break it does so into many hundreds of small pieces to reduce risk of harm. Laminate glass – two pieces of glass with an invisible layer of plastic sandwiched between. Should it break it holds together and remains stable. Acoustic glass – with a similar principle to laminate glass but using a thicker plastic “sandwich”. This increases sound reduction from the 18 decibels reduction of 4 mm single glazing or 25 decibels of standard double glazing to 45 decibels using acoustic glass. NB: For some years now there has been a code of practice for safety within the Spanish glazing industry similar to that in the UK but it has never been enforced. As a company we endeavour to inform clients along these guidelines where they would come into play. There are basically three different types. Tinted – reduces glare but can make the view seem dull. Reflective – sometimes used for privacy due to its mirror effect, but at night the strongest light source is inside the house so the homeowner won’t be able to see out, although anybody outside will be able to see in. Sun guard – a sophisticated glass that reduces solar intake but avoids the tinting . On reflection of the other two types, it also has the added ability of reflecting interior radiant heat back into the room that would be lost through ordinary double glazing (very much a revere process to reflecting sunshine out) this gives this glass a very high effective insulation value. Low E or Pilkington glass – this product reflects heat back into the room in the same way as sun guard but without the solar control, so in winter “free” solar heat can enter the home. Mosquito nets can be added to your windows and can be either sliding or rollable. © Copyright Crystal Windows. All rights reserved.